Love of the blues. Love of Stevie Ray Vaughan. The love of re-creating a feeling that so many enjoyed — and so many missed. These are the things that drove the creation of Crossfire, a tribute band that strives to capture the essence of a Stevie Ray Vaughan and Double Trouble concert with authenticity, respect, and yes, love. Anyone who was ever fortunate enough to experience Stevie and Double Trouble’s driving blues-rock in concert will never forget the way they played together live. Playing blues rock since the 60’s, Alan Iglesias draws from a wealth of SRV musical history and knowledge as well as his own life experience to faithfully reproduce the famed Texas “thundershuffle” and perform each show ever-mindful of the tremendous resposibility that he bears…to do his very best to bring back as much of the orignal experience as he possibly can, every time he performs. 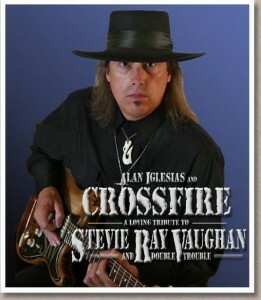 CROSSFIRE is currently touring extensively making Stevie Ray Vaughan fans ecstatic wherever they go. No matter where they play or what the circumstances, one thing that you can count on is that Crossfire will bring their full-on pedal-to-the-floor show every time they take the stage.